Taken at the same site as February’s winning photograph – Ramsay Conservation Park on Yorke Peninsula, the winning photograph was of an Arcahnorchis sp. by Pauline Meyers. A positive identification was not possible due to a number of factors making firm identification difficult. Most likely it is a hybrid of the Green-combed group of spider orchids and though not positively identified there are some things that can be observed. The Green-combed group according to Gary Backhouse consists of three sub-groups, A dilatata (largest sub-group), A concinna and A integra, but David Jones has them as three separate gorups. From the photograph it can be seen that all the green-comb features are visible except for the clubs, The dorsal sepal is obviously thickened but it is not as clear for the other two sepals. This could be due to the angle of the photograph. Another observation to note is that it is a freshly opened flower as suggested by the elongated appearance of the labellum. As the flower ages the labellum curls further under itself. It is important to remember that an old flower and a young flower of the same species could be mistaken as two different species. To iterate from last month – Orchids are an interesting group concerning identification. Some are extremely easy to identify but others not so. Backhouse, G. (2011). 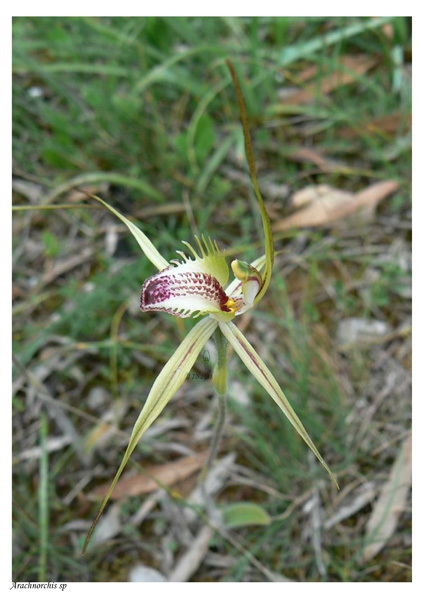 Spider-orchids – the Genus Caladenia and its Relatives in Australia on CD Rom. Jones, D. L. (2006). A Complete Guide to Native Orchids of Australia including the Island Territories, (2nd ed.). Frenchs Forest, N.S.W., Reed New Holland. Thank you to Thelma Bridle for reviewing the article. This entry was posted in Monthly photo competition, Orchid Identification and tagged Arachnorchis, Caladenia, Orchid Identification, orchids, photography. Bookmark the permalink.